The last time the New Orleans Saints hosted the Philadelphia Eagles, it was Week 11 and the final score included a 41-point margin in favor of the home team. The outcome likely won’t be as lopsided on Sunday in the rematch, but one aspect should remain consistent: the Saints’ formidable rushing duo. Alvin Kamara has proven himself to be one of the best all-around running backs in the NFL in just his second season, and Mark Ingram II is everything a team could want in a power runner. They complement each other better than any other backfield combo in the league, and that should have the Eagles worried after what the seventh and 13th-graded running backs were able to accomplish in the first meeting. 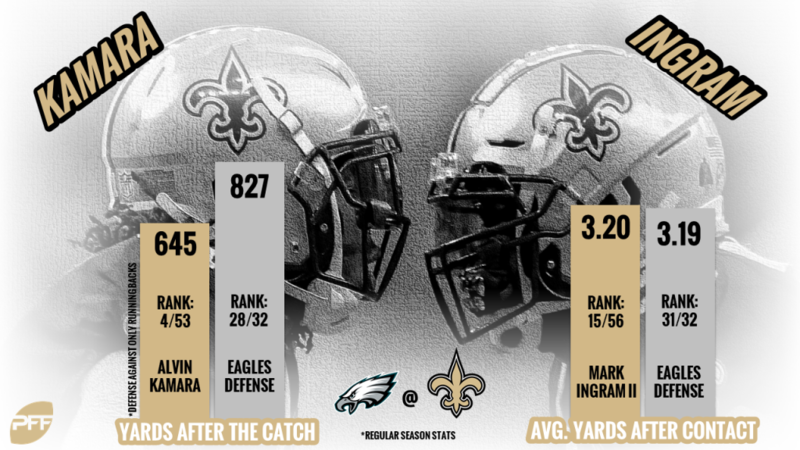 The well-documented successes of Kamara (84.1 overall grade) and Ingram (81.1 overall grade) match up well against an Eagles defense that has fared poorly against running backs all year. In the regular season, only the Atlanta Falcons gave up more completions to running backs than the Eagles’ 108 receptions allowed, and only four other teams allowed more yards on those receptions. That’s concerning purely from a passing game standpoint, as Kamara racked up the fourth-most receptions (81), fifth-most receiving yards (709), fourth-most yards after the catch (645) and third-highest receiving grade (87.6) among running backs. Ingram has excelled at his power style, averaging a career-high 3.2 yards after contact per carry. Unfortunately for the Eagles, they’ve done a similar job of bringing runners down, allowing 3.19 yards after contact per carry — second-worst among defenses. But while many think of Ingram as a downhill runner, much of his production comes on runs to the outside. On runs to the right or left of the offensive line, Ingram had the sixth-most avoided tackles (15) and on average, the third-most yards after contact per attempt (4.52). When Ingram is afforded the opportunity by his opposition to bounce outside, few have been able to stop him. His seven runs of 15 or more yards on outside runs are tied for eighth among running backs. The Saints’ runners avoided 84 tackles in the regular season, ranking fourth, while the Eagles defense finished sixth-worst by averaging 0.17 missed tackles per attempt. The shifty duo — in both the air and ground game — should pose significant problems for a defense that has shown vulnerabilities to Kamara and Ingram’s strengths. Not only do the Eagles have to worry about Kamara as a receiver or Ingram as tough to tackle, but Kamara can run, too — and well. He’s had just one 100-yard rushing performance on the year, but he’s been extremely efficient while splitting carries with Ingram. Among running backs with 75-plus attempts, Kamara ranks second in attempts per first down (3.4). In other words, despite having the 16th-most carries, Kamara finished the regular season with the fifth-most first down rushes. No team faced fewer rushing attempts than the Eagles in the 2018 regular season, but few teams had more problems than them wrapping up runners on initial contact, and few teams had as much success in both phases of offense as Kamara and Ingram. The 48-7 thrashing the Saints laid on the Eagles in Week 11 was the warning shot, and Sunday will determine if needed adjustments have been made since then.